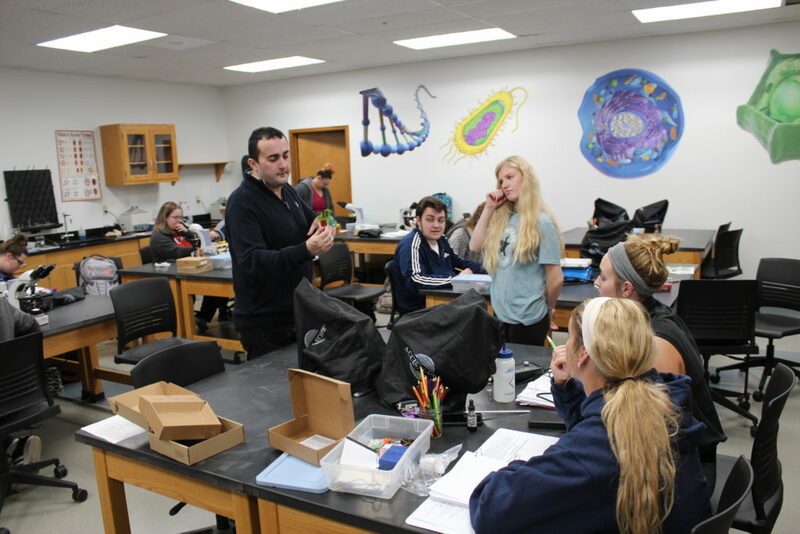 From left, Dr. Emad Tahtamouni, who joined the NTCC biology faculty this fall, teaches students about photosynthesis during a recent biology lab class. He earned his B.A. and M.A. in his home country of Jordan before getting his Ph.D. from New Mexico State University. Dr. Emad Tahtamouni, a biologist specializing in plant science and soil microbiology, is the newest member of Northeast Texas Community College’s full-time faculty. It’s taken him 10 years to get here and his journey has been characterized by challenges most of us will never face. He earned his B.A. and M.A. in his home country of Jordan before being accepted as a doctoral candidate at New Mexico State University. When he arrived at NMSU, his first challenge was to land a university job to help with tuition. In the beginning his English was virtually indecipherable and his students reacted by making fun of him. For a man who loves teaching, no wound could cut deeper. He spent hours with friends who spoke both Arabic and English learning how to express specific instructions. He began arriving to the classes he taught an hour early to write those instructions on the board so students would understand what to do that day. His semesters of effort paid off. Tahtamouni not only earned his Ph.D., he won a scholarship and a teaching award from NMSU. After graduation he landed a couple of adjunct teaching positions, first at his alma mater, then in the El Paso Community College system. Looking back, he says that what began as a mortifying experience turned out to be one of the best periods of his life. Then, last June, he saw NTCC’s online ad for a full-time biology professor. A position as a full-time professor is the Holy Grail in academia. Competition is fierce and repeated rejection can be demoralizing. Dr. Mary Hearron, professor and division chair for biology and chemistry, said the NTCC hiring committee received a large number of applications. From those, the field was narrowed to about five or six applicants who were interviewed by phone. From these, three job candidates were selected for onsite interviews. After two months on the job, Tahtamouni describes NTCC students as respectful, hardworking and, for the most part, smart. He respects the “sensitive stage” they’re at in their lives.